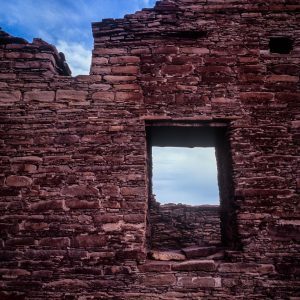 The next day would be the last the three of us would explore Chaco Canyon together. 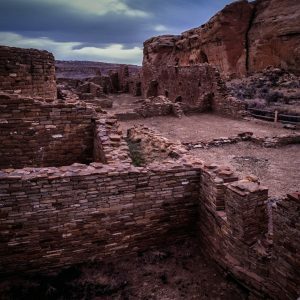 It was Thursday April 5, and our first stop was Chetro Ketl, nearly 4 acres of magnificent Kivas and Great Houses. 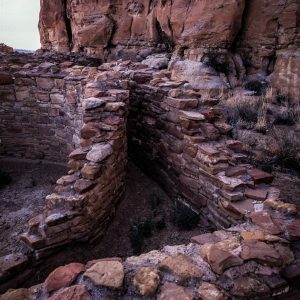 It has three elevated kivas and also the Great Kiva, the largest in the complex. The day was also mixed with clouds, sun and a slight breeze…very comfortable conditions for photography. 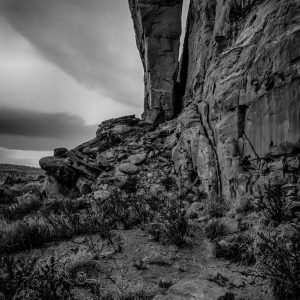 As we approached from the trail I noticed that my 24mm wide-angle lens gives the illusion that the ruins are much closer to the mesa wall than they really are, almost as if the ruins grew out out of the rock. 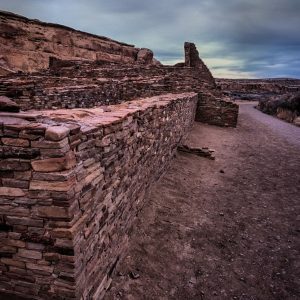 The north wall of the complex is the largest in Chaco Canyon and was my favorite feature of Chetro Ketl. 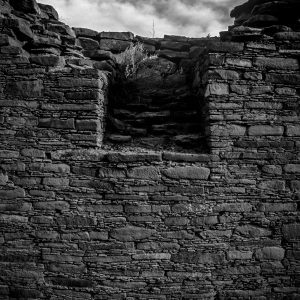 The intricate precision of the masonry and the size of the wall provided excellent wide-angle compositions. Again, we see this delicate stone work only because the outer layer has been worn away by time. As before Sherisa and I photographed our way from the outside to the interior of the complex and once again we had the place virtually to ourselves. There were maybe five or six other people exploring the ruins. 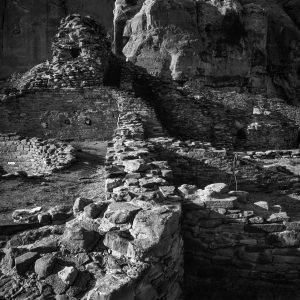 Chetro Ketl is a temple for those seeking complex compositions, abstract angles, patterns, and textures. 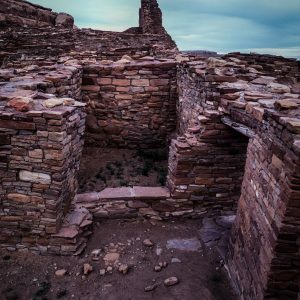 The nearly three hours we spent there was certainly not enough time for all of these but we know that Chaco will be calling us back…. And we will of course return. Another feature of Chetro is the separate Western section, called Talus Unit. 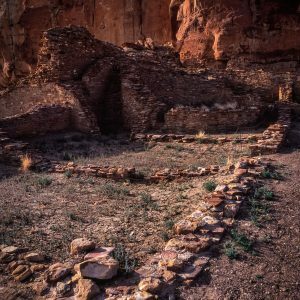 This smaller structure is built immediately against the mesa wall. 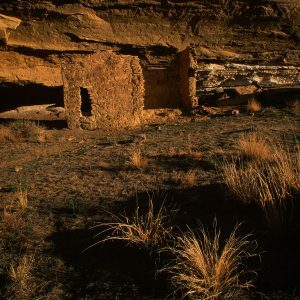 We spent some time here as well, shooting foreground elements leading to the wall of the mesa. And just to the west of this is the striking view of “Son of Threatening Rock”. 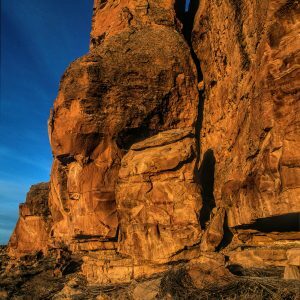 Here is another section of rock that has separated from the wall, its stable future highly uncertain. 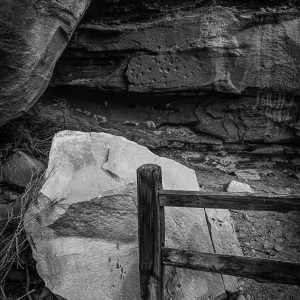 From the side it looks like a spike driven into the ground against the cliff. For me this was one of those images that “composed” itself, no need for the “rule of thirds”.